CSA 5,5 - 20HP is a modern designed rotary screw compressor with industrial capacity up to 71 cfm and a wide choice of variants! The CSA 5,5 - 20HP range is high-class equipment designed for a small workplace and can fulfill industrial requirements up to 71 cfm. Units are available running on fixed speed or running on variable speed (IVR regulation), but both are very economical. Floor mounted, the compressor can be used as an extension of your existing air system or can be placed close to the place of use. The CSA Tank-mounted (270 or 500L) is a perfect stand-alone system for your workplace. The all-in-one CSA Dryer version guarantees complete dried and filtered air on your workshop floor. There is the possibility of filters and by-pass for compressed air demands without oil. 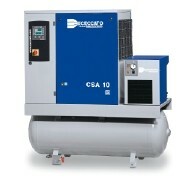 A CSA belt-driven unit combines all your expectations in one compact and reliable compressor unit on a small footprint.